The primary telescope of the UCA Observatory is a Meade 14-inch aperture LX200R GPS telescope. 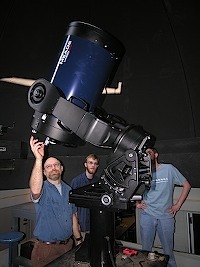 The observatory is used for faculty and student research projects and public observing nights. UCA Campus, Lewis Science Center (stairs located in front lobby). The observatory is open to the public the third Wednesday night of the month (if the sky is clear) for a couple of hours after dark. Wednesday January 18 @ 6 p.m. to 8 p.m.
Wednesday February 15 @ 7 p.m. to 9 p.m.
Wednesday March 15 @ 8 p.m. to 10 p.m.
Wednesday April 19 @ 9 p.m. to 11 p.m.